An Indian girl, born with four eyes, two noses and two mouths rests in her father’s lap at the Saini Village of Noida, some 55 kms from New Delhi, on April 5. The parents of the girl say that the toddler is doing well and that they have no plans for a surgery. Mother Sushma holds her daughter Lali at their residence in Saini Sunpura, 50 kilometers (31 miles) east of New Delhi, India, Tuesday, April 8, 2008. 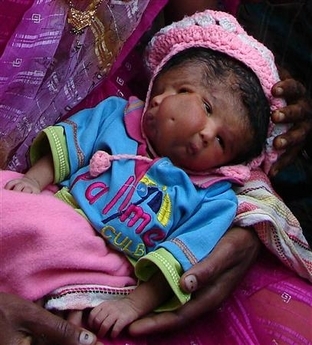 The baby with two faces, two noses, two pairs of lips and two pairs of eyes was born on March 11 in a northern Indian village, where she is doing well and is being worshipped as the reincarnation of a Hindu goddess, her father said Tuesday. 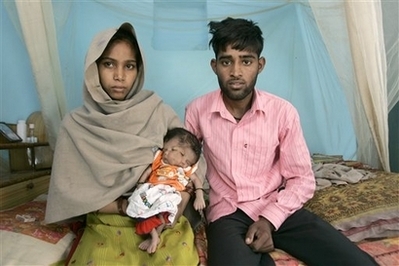 Mother Sushma holds her daughter Lali as her husband Vinod Singh stands next to them at their residence in Saini Sunpura, 50 kilometers (31 miles) east of New Delhi, India, Tuesday, April 8, 2008. 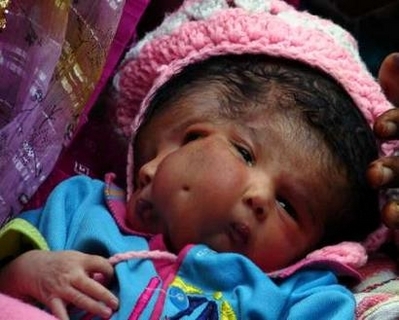 The baby with two faces, two noses, two pairs of lips and two pairs of eyes was born on March 11 in a northern Indian village, where she is doing well and is being worshipped as the reincarnation of a Hindu goddess, her father said Tuesday. A girl born with two faces rests in her relative’s lap at Saini village in Noida, some 55 km (34 miles) from New Delhi March 15, 2008. Picture taken March 15, 2008. 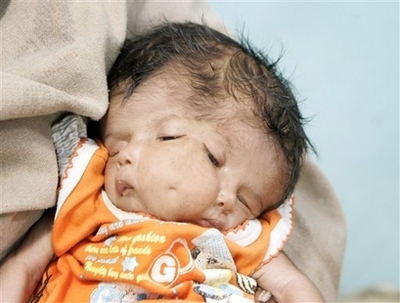 A girl born with two faces rests in her house at Saini village in Noida, some 55 km (34 miles) from New Delhi March 15, 2008. Picture taken March 15, 2008. A girl born with two faces rests in the village of Saini near New Delhi in this March 15, 2008 file photo. The family of the baby has refused special medical treatment for the infant, saying she is the incarnation of a Hindu goddess. 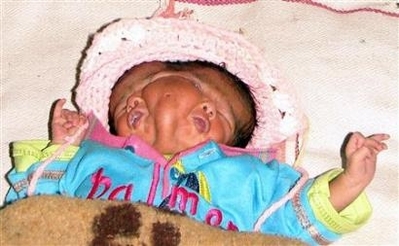 The month-old girl suffers from what appears to be craniofacial duplication, an extremely rare congenital disorder in which part of the face is duplicated on the head. Media reports said she ate with both mouths and blinked all four eyes. The anomaly gave the newborn god-like status in the village, with hundreds of people flocking to the family’s dilapidated brick house to worship her and seek blessings. Father Vinod Singh sits next to his daughter Lali at his residence in Saini Sunpura, 50 kilometers (31 miles) east of New Delhi, India, Tuesday, April 8, 2008. The baby with two faces, two noses, two pairs of lips and two pairs of eyes was born on March 11 in a northern Indian village, where she is doing well and is being worshipped as the reincarnation of a Hindu goddess, her father said Tuesday. Father Vinod Singh holds his daughter Lali at his residence as visitors touch the child’s feet in reverence in Saini Sunpura, 50 kilometers (31 miles) east of New Delhi, India, Tuesday, April 8, 2008. The baby with two faces, two noses, two pairs of lips and two pairs of eyes was born on March 11 in a northern Indian village, where she is doing well and is being worshipped as the reincarnation of a Hindu goddess, her father said Tuesday. Parents Sushma, left, and Vinod Singh pose with their daughter Lali at their residence in Saini Sunpura, 50 kilometers (31 miles) east of New Delhi, India, Tuesday, April 8, 2008. The baby with two faces, two noses, two pairs of lips and two pairs of eyes was born on March 11 in a northern Indian village, where she is doing well and is being worshipped as the reincarnation of a Hindu goddess, her father said Tuesday. these baby are so cute .